Water is poured on the head of an infant held over the baptismal font of a Catholic church. In Christian religious practice, infant baptism is the baptism of young children or infants. In theological discussions, the practice is sometimes referred to as paedobaptism or pedobaptism, from the Greek pais meaning "child." The practice is sometimes contrasted with "believer's baptism," which is the practice of baptizing only individuals who personally confess faith in Jesus, therefore excluding small children. Most Christian denominations accept the doctrine of infant baptism. Roman Catholics, Eastern Orthodox, Oriental Orthodox, Assyrian Church of the East, Anglicans, Lutherans, Methodists, Church of the Nazarene, Reformed Church in America, Episcopalians, United Church of Christ, Presbyterians, Continental Reformed, and others, baptize infants. Together, these constitute over 80 percent of all those who call themselves Christians. However, since the Protestant Reformation, numerous denominations practice adult or believer's baptism, including Baptists, Pentecostalists, Anabaptists (Mennonites, Amish, Brethren), Seventh-day Adventists, Jehovah's Witnesses, Christadelphians, Latter-day Saints, and several Non-denominational churches. The exact details of the baptismal ceremony vary among Christian denominations. Many follow a prepared ceremony, called a rite or liturgy. In a typical ceremony, parents bring their child to their congregation's priest or minister. The minister then applies water to the child. As the water touches the child, the minister utters the words "I baptize you in the name of the Father, and of the Son, and of the Holy Spirit" (See Matthew 28:19). Most Christians baptize their baby by either pouring water (affusion) or by sprinkling water (aspersion) on the child. Some Eastern Orthodox and Roman Catholic traditions baptize their babies by totally immersing them in the font. Although it is not required, many parents and godparents choose to dress their baby in a white gown called a christening gown for the baptism ceremony. Christening Gowns often become treasured keepsakes that are used by many other children in the family and handed down from generation to generation. Traditionally, this gown is white or slightly off white and made with many laces, trims and intricate details. In the past, a gown was used for both baby boys and girls. In more modern times, it has become appropriate to baptize boys in christening outfits. Also made of white or off white fabric, the christening outfit consists of a romper with a vest or other accessories. After the baptism ceremony, these articles of clothing are preserved as a memory of this very special and significant event in the child's life. Scholars disagree on the date when infant baptism was first practiced. Some believe that first-century Christians did not practice it. Others believe that they did, understanding biblical references to individuals "and [their] whole household" being baptized (Acts 16:15, Acts 16:31-33) as including small children and infants. The earliest extra-biblical directions for baptism, which occurs in the Didache (c. 100), seems to envisage the baptism of adults, rather than young children, since it requires that the person to be baptized should fast.However, writings of the second and early third century indicate that Christians baptized infants too. Tertullian (c. 155–230) too, while advising postponement of baptism until after marriage, mentions that it was customary to baptize infants, with sponsors speaking on their behalf (On Baptism 18). The Apostolic Tradition, attributed to Hippolytus of Rome (d. 235), describes how to perform the ceremony of baptism, including a profession of faith; states that if children could not answer for themselves, their parents or relatives were to answer for them. From at least the third century onward Christians baptized infants as standard practice, although some preferred to postpone baptism until late in life, so as to ensure forgiveness for all their preceding sins. The belief that people baptized as infants needed to be re-baptized arose only in the sixteenth century. The basic theology of Christian denominations often varies. For this reason, the meaning of baptism itself and infant baptism in particular depends greatly upon the Christian tradition to which the baptismal candidate belongs. Baptism in the New Testament, especially in the letters of Saint Paul, is seen both as analogous to circumcision, and as a type of burial and symbolic rebirth. In Jewish tradition male infants born to Jewish parents and male slaves owned by Jews were circumcised as a ceremony of initiation into the Jewish community. (Genesis 17:10-14) Jewish Christians continued to circumcise their children (Acts 21) and even Paul himself reportedly circumcised his disciple Timothy, who had a Jewish mother and a Gentile father. Paedobaptists, however, generally believe that baptism has replaced Old Testament circumcision and is the religious ceremony of initiation into the Christian community. Beyond this, very little is agreed on regarding the subject among Christian denominations. Paedobaptists disagree about the precise significance of infant baptism and the exact justification for it. These differences generally revolve around the question of the spiritual effect which baptism has on the person being baptized. The Roman Catholic Church considers baptism, even for infants, so important that "parents are obliged to see that their infants are baptized within the first few weeks" and, "if the infant is in danger of death, it is to be baptized without any delay." Baptism is a form of rebirth which liberates the believer from original sin: "Born with a fallen human nature and tainted by original sin, children also have need of the new birth in Baptism to be freed from the power of darkness and brought into the realm of the freedom of the children of God, to which all men are called… The Church and the parents would deny a child the priceless grace of becoming a child of God were they not to confer Baptism shortly after birth." The Church has no official teaching regarding the fate of infants who die without Baptism, and theologians of the Church hold various views. For instance, some have asserted that they go to Limbo, although this is not official Catholic doctrine. The Eastern Orthodox Church, Oriental Orthodoxy and the Assyrian Church of the East also insist on the need to have infants baptized as soon as is practicable after birth. For them, too, baptism is not merely a symbol but actually conveys grace. Baptism is a sacrament because it is a "tool" or "instrument" instituted by Jesus Christ to impart grace to its recipients. Infants are traditionally baptized on the eighth day, recalling the biblical injunction to circumcize on the eighth day. However, this is not mandatory. 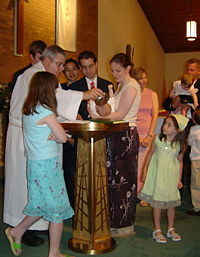 In many of these churches, the Sacred Mystery of Chrismation (Confirmation) is administered by the priest immediately after baptism, even of infants. Unlike Catholic tradition, Holy Communion is given to infants after they are baptized. Lutherans practice infant baptism on the basis of biblical passages such as Matthew 28:19, Mark 10:13-15, 16:16, John 3:3-7, Acts 2:38-39, and Ephesians 6:4. For them, baptism is a "means of grace" through which God creates and strengthens "saving faith" as the "washing of regeneration" (Titus 3:5) in which infants and adults are reborn (John 3:3-7). In Lutheran theology, since the creation of faith is exclusively God's work, it does not depend on the actions of the one baptized, whether infant or adult. Even though baptized infants cannot articulate that faith, Lutherans believe that it is present all the same. The guilt of Original Sin is removed. They gain admission into the Church. Their standing before God is changed from one under condemnation to a child of God. However, Wesley's views of infant baptism seem to shift over time as he put more and more emphasis on salvation by faith and new birth by faith alone. This has helped to fuel much debate within Methodism over just what infant baptism does, though almost all are agreed it should be continued. Methodists justify infant baptism by this principle of prevenient grace initiated by God, in which God's promise is provided calling that infant to eventually believe in God's Word for salvation. Methodists also use infant baptism symbolically, as an illustration of God approaching the helpless. Presbyterian and Reformed Christians contend that baptism is not a mere symbol, but actually conveys grace. Baptism, according to this tradition, does not produce Christians, but it identifies the child as a member of the covenant community. Presbyterian and many Reformed Christians see infant baptism as the New Testament form of circumcision, which did not create faith in the eight-day-old Jewish boy but marked him as a member of God’s people. Children baptized as infants or toddlers are sometimes asked to "confirm" their baptismal vows, when they are roughly between eight and 14 years of age, by publicly affirming their faith. Confirmation of baptismal vows is the essential significance of the Lutheran non-sacramental ceremony called in German "Konfirmation," but in English "affirmation of baptism." However, for Roman Catholics, Confirmation is not an essential affirmation of faith, but is a sacrament that confers an increase and deepening of the grace provided at baptism. In the Latin-Rite (i.e., Western) Catholic Church, the sacrament is to be conferred at about the age of discretion, generally taken to be about seven. In Eastern Christianity, including the Eastern Catholic Churches, the sacrament of Confirmation is conferred immediately after baptism, and there is obviously no renewal of baptismal promises. In the United Methodist Church, Confirmation is a rite where baptized individuals recognize the work of God's grace as well as an embrace of being a disciple. It often occurs when youth enter their junior high school years, but it may occur at any time that a person is ready to profess their faith. Opponents of paedobaptism generally view baptism as related to a conscious professional of faith, which an infant is incapable of performing. They point out that all of Jesus' disciples were baptized as adults, that Jesus himself was baptized at the age of 30, and that there is little evidence of infant baptism in the early church. They see Matthew 28:18-20 as giving exclusive instructions about who is to be baptized: "Go therefore and make disciples of all nations, baptizing them in the name of the Father and of the Son and of the Holy Spirit, teaching them to observe all things that I have commanded you." (verses 19-20, NKJV) They interpret this as referring to three successive stages, with baptism following on becoming a disciple (which is beyond the power of an infant), and instruction following baptism, not preceding it. In Peter's address to adults, "Repent and be baptized" in Acts 2:38, they see repentance as a prerequisite, and this requires a mature understanding of sin and a decision to turn away from sin. Denominations that do not accept infant baptism as valid generally require Christians who join them after being baptized as infants elsewhere to be "rebaptized." This practice led to Anabaptists and similar sects being persecuted as heretics in Europe, motivating some to come to the United States, where the adult baptist denominations were ultimately welcomed into the mainstream. Among the Christian denominations and other religious groups opposed to paedobaptism on theological grounds are Baptists, Apostolics, Pentecostals, Anabaptists (including Mennonites and Amish), Seventh-day Adventists, Reformed Baptists, Jehovah's Witnesses, Latter-day Saints, and Christadelphians. ↑ "the Didache, the earliest surviving 'pastoral manual' of the Christian church" (Fuller Seminary Bookstore). www.fullerseminarybookstore.com. Retrieved November 12, 2007. ↑ "Chapter 7, "Concerning Baptism." www.earlychristianwritings.com. Retrieved November 12, 2007. ↑ "Before the baptism let the baptizer fast, and the baptized, and whoever else can; but you shall order the baptized to fast one or two days before" (Didache, 7). ibid. ↑ "The children shall be baptized first. All of the children who can answer for themselves, let them answer. If there are any children who cannot answer for themselves, let their parents answer for them, or someone else from their family. After this, the men will be baptized. Finally, the women" (The Apostolic Tradition of Hippolytus of Rome 21.4-5). www.bombaxo.com. Retrieved November 12, 2007. ↑ Code of Canon Law, canon 867. www.intratext.com. Retrieved November 12, 2007. ↑ Catechism of the Catholic Church, 1250. www.scborromeo.org. Retrieved November 12, 2007. Baptism by Francis Schaeffer (Evangelical Presbyterian perspective). www.fivesolas.com. Infant Baptism: How My Mind Has Changed by Dr. Dennis E. Johnson (Conservative Presbyterian perspective). thirdmill.org. JEREMIAH 31: INFANT BAPTISM IN THE NEW COVENANT by Dr. Richard Pratt (Evangelical Presbyterian perspective). thirdmill.org. Instruction on Infant Baptism (Roman Catholic Church). www.ewtn.com. This page was last modified on 3 March 2018, at 00:15.